First Team offers the Olympian, an adjustable basketball goal designed for parks and playgrounds. With the turn of a crank, the goal easily adjusts in height from 6-1/2 feet to 10 feet. The Olympian is among the most massive units available with its 6-inch-by-8-inch-by-1/4-inch-thick pole and heavy-duty extension arm assembly. The system is equipped with a regulation-size 42-inch-by-72-inch clear acrylic backboard and a heavy-duty breakaway goal. With its durable design and construction, this unit will stand up to the aggressive play experienced in unsupervised parks and playgrounds. The unit is protected by First Team's "superior lifetime warranty." AAE offers a wide variety of soccer goals for every level of play—college, high school or club teams. All goals are engineered from high-tech aluminum alloys for maximum durability. The main frame is fabricated of either 4-inch-square with rounded safety corners or 4-inch-diameter round slotted heavy-wall aluminum extrusion. The goal mouth features a white, powder-coated finish for minimal maintenance. Large loop stays and a groundbar made of 2-inch-square slotted heavy-wall aluminum extrusion with rounded safety corners are standard. The crossbar and groundbar each incorporate a one-piece design (no horizontal joints) for added stability. Portable models feature Rollaway Wheels. The Monopole Batting Cage from Master Pitching Machine easily is distinguishable by its "tent top" design. It is built in six-, eight- and 10-stall units with a standard depth of 92 feet. From all areas within the cage, the concrete floor is sloped to a central point where an elevator picks up the balls and re-feeds the machines. It features an enormous hitting area that lets the batters see their hits fly above and beyond the machines. Because of this, the Monopole is a preferred cage style of customers and operators from coast to coast. Bison ShootOut portable aluminum soccer goals are offered in three styles with 4-inch-square, 4-inch-round or 2-inch-by-4-inch aluminum crossbar and corner posts. All ShootOut soccer goals feature QwikTrack net attachment tracks that eliminate Velcro, wire clips, welded-on or screwed-on net attachment systems. There are also extra-deep, 4-foot-top, 10-foot-bottom galvanized-steel backstays for added player safety. The torque-tested backstay attachment virtually eliminates corner weld failure too common on other portable soccer goals. Wheel kits are standard on 4-inch-square and 4-inch-round goals. Bison's DuraSkin for soccer player safety padding will fit all brands of 4-inch-square, 4-inch-round, 2-inch-by-4-inch and 4-3/8-inch elliptical goals. The new Douglas Sport Nets & Equipment catalog illustrates the complete product line, which includes tennis, baseball, basketball, soccer, volleyball, hockey and custom products. Products include tennis nets and posts; backdrop curtains; gym dividers; custom netting; protective padding; volleyball posts and nets; baseball, softball and golf cages; and protective netting. With more than 30 years of experience, Douglas is dedicated to fulfilling your sport equipment needs. 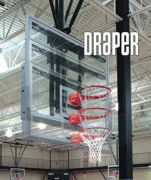 Draper offers among the most complete and highest quality lines of gymnasium equipment available, including basketball backstops, divider curtains, wall pads, volleyball systems, mat lifters and more, allowing you to deal with a single source for all gymnasium equipment needs, instead of multiple manufacturers and multiple suppliers. Draper's industry-leading product quality starts with the skill and commitment of Draper's design and manufacturing staff and continues through the life of your facility. Draper and its network of dealers provide complete service from project infancy through installation and beyond and can help with equipment selection, writing specifications, facility layout and design. Future Pro offers a broad selection of complete playground basketball systems on gooseneck and adjustable-height poles. Pole-size options include 3-1/2 inches, 4-1/2 inches and 5-9/16 inches o.d. Backboard options are fan-shaped and rectangular in aluminum, steel, polyethylene or clear polycarbonate. The system shown, PR52, is at park playgrounds and schools in Lincoln, Neb. It has a rust-free aluminum goal mounted to a heavy-duty 4-1/2-inch gooseneck pole. This backboard has a lifetime limited warranty, and the pole a 25-year limited warranty. The heavy-duty, double-rim goal on the PR52 has an unconditional lifetime replacement warranty. Optional pole padding is shown. The ProBatter Sports line of video pitching machines shows a DVD-quality image of a pitcher winding up before a ball is thrown through a hole in the projection screen. ProBatter offers conversion kits for your exiting baseball or softball pitching machines and complete kits that include everything. ProBatter also can work off of your ball-retrieval systems. Whether you're looking to train for the big leagues or just want to have some fun, ProBatter has a machine for you. Turn your cages into a state-of-the-art revenue-generating attraction.